We are a committed tour and travel company engaged in providing prompt international tours packages to all our worthy customers. We are engaged in taking you to the world famous places namely, France, Germany, Japan, Canada, USA, Malaysia, Thailand and Holland. The tour packages are planned only after keeping in mind the discussed budget and all the requirements. 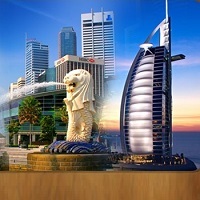 All of you can obtain our international tour packages at the most reasonable prices as compared to others in the market. Stop pondering much, pick up your phone and contact us straightaway.